I don’t know how this one got left behind. As fall approaches hopefully there is some time left to slide in one more ice cream recipe for sure, what say :-). Well people in the hotter regions of the world can always make this right now. Quite different and pleasing in taste, this ice cream has a creamy fresh herb taste, complemented perfectly by the golden toasted pine nuts, the mild presence of the extra virgin olive oil and the sweet honey. 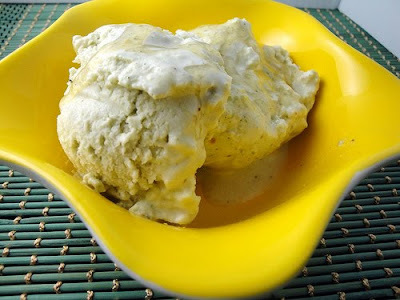 One thing I did leave out of this ice cream was the garlic which is a regular ingredient in pesto. I didn’t want to be that adventurous the first time I was making pesto ice cream. Get the ice cream out of the freezer and set it aside at room temperature to soften it a little for easy mixing. On a pan on low to medium heat, dry roast the pine nuts until they are golden brown. You don’t need to add oil as the pine nuts are fatty nuts, and will release oil when they are hot. Keep aside. Chop the fresh basil and mint leaves as fine as possible. In a spice grinder or any method you find easy (even a blender, although it might be tough), add the oil and the minced leaves and crush into a paste, as fine as possible. In a bowl add the heavy cream and the ground paste of fresh basil, mint and oil and bring to a boil on medium heat. Immediately take it off the heat and let it cool. Once cool, add the heavy cream mixture and toasted pine nuts to the ice cream in a large bowl and mix everything well. Put the ice cream mix back into its original container, and with each layer of ice cream, drizzle an ample amount of honey as you fill up the container with the ice cream. Freeze the ice cream for a few hours until frozen. Drizzle with more honey when you serve. So, surprise your friends and your palette by making this ice cream and leaving your guests guessing the ingredients ;-).